The history of the famous British ironworks and anvil manufacturer. 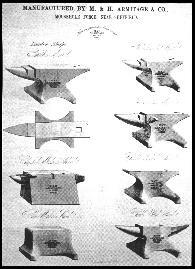 A book for collectors, historians and those interested in anvils. With these words from Rivelin By Joseph Senior (1819-92), Richard Postman opens his latest ode to the anvil and once again makes a major contribution to the blacksmithing community. This could, I suppose, be called a coffee table book. Certainly it is lavishly illustrated. Nearly all of it's 108 pages has one or more sketches, photographs, or reproduction of old advertisements. Starting with the story of how he met his co-authors John and Julia Hatfield and chronicling their restoration of several of the original buildings of the Mousehole Forge in Sheffield, England, Postman does his usual thorough job of introducing the colonists to the origins of so many of our favorite anvils. In the process, he corrects some errors that had in-advertently crept into his seminal volume, ANVILS IN AMERICA. 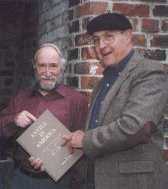 with co-author John Hatfield, October 1998. Below, What other's have to say. ONE of the pleasures of life I rediscover from time to time is reading, as well as listening tp Radio 4 and Raido Sheffield. At the moment I have on my lap a beautiful little book fit to grace the Warring and Gillow coffe table in Worrall. 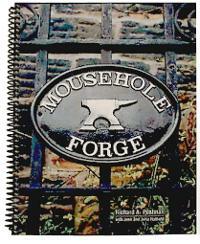 Its a history of Mosehole Forge, Malin bridge, and is beautifully and comprehensively illustrated. It's written by and American chap, Richard A. Postman, together with the owners and rescuers of the ruins of the Forge, John and Julia Hatfield. I could wax lyrical over the facinating story of Mousehole anvils and their place in Shefield's INdustrial history. a story of which I was only baguely aware. One or two antecdotes for you about the book and the people involved. Richard has obviously fallen in love with the place and his photographs show the area at its most attractive, autumn. How can you not like a guy the refers to Supertram as an 'electric stree car' and who includes a photograph of the front door of the Anvil pub and a chapter on 'Miscellaneous and Ramblings'? If we a can name our rural buses and historical characters, why not our local Malin Bridge 'street car'? John and Julia will be known to quite a few locals, former apothecaries, who after many years of grinding pestle into mortar and dispensing pharmaceuticals to all and sundry, took on a task akin to cleasning the Augean Stables, in restoring a bit of Sheffield history. John has had ill helath recently but his reputation as a devotee of the art of table tennis, one of his many enthusiasms, remains robust. I remember the time he and I lugged the date stone of Upper Owelerton Wheel into Mousehole, where it remains today to preserve a link to a pience of industrial history whose site is not a car park. 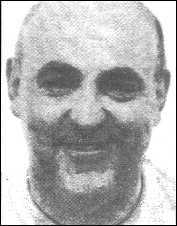 He and Julia also put together a study of Thomas Boulsover and old Sheffield Plate, which is the seminal work on the subject. While 'Mousehole FOrge' was written by an American and overseas market in mind (surprising how others value our history while we don't) its also one for we locals to enjoy, as Richard echorts us to. So Richard, John and Julia, thanks, from a local. Price $24.50 plus S&H. Call 336 - 367 - 3499 to order. 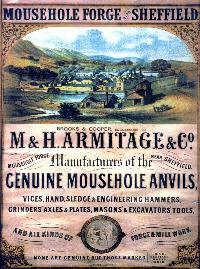 Anvil maker, M&H Armitage, Brooks, Cooper, blacksmith, forge, mousehole, England, book, history, industry and technology. Period reinactment gear. Mouse in a mouse hole, M&H Armitage, Brooks, Cooper, blacksmith, forge, mousehole, book, history of Britich industry and technology. Period reinactment gear.